Over the past 15 months, LeBron James established himself as basketball royalty by capturing an Olympic Gold Medal, his second consecutive NBA Championship, fourth league MVP and being named Sports Illustrated Sportsman of the Year. Now POWERADE ZERO DROPS is giving athletes across the country an inside look at James’ rigorous practice regimen that helped him Power Through and elevate his game. 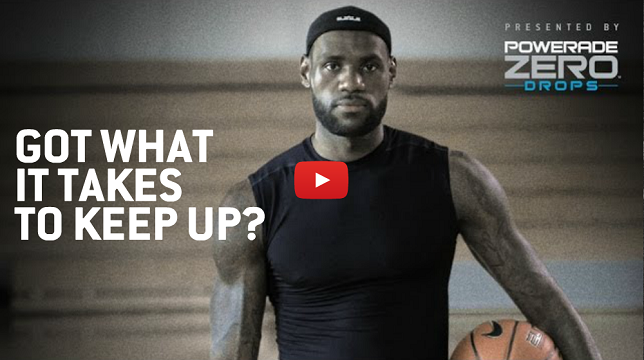 “LeBronTime” chronicles a typical, one-hour training session for the reigning NBA Finals MVP. The video will be housed on YouTube and obviously something of this length will tempt users to skip ahead, which presents an opportunity for James to deliver words of wisdom for athletes everywhere. Each time users try to fast forward, pause or interact with other YouTube functionalities, they’ll be served a message from James himself encouraging them to eliminate those distractions and focus on what matters: their game. In support of LeBron’s message that there are no shortcuts to success, POWERADE ZERO DROPS provide athletes with the ease they need to stay on the court. POWERADE ZERO DROPS are simple to use, requiring only a sports bottle and water fountain, and give athletes the hydration they need to power through. Print article This entry was posted by Art Eddy III on October 23, 2013 at 6:35 am, and is filed under Sports, Videos. Follow any responses to this post through RSS 2.0. Both comments and pings are currently closed.